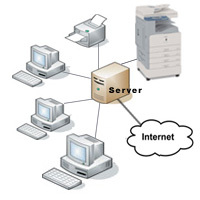 Microsoft Computer Systems and Networks. Your office IT systems can run more efficiently in an effort to save you money! For small and medium-sized businesses with 5 to 50 computer desktops we provide a solution that takes the worry out of your IT infrastructure. We also service distributed operations of large enterprises with multiple offices, retail outlets, or franchise sites. Our IT Managed Services solution integrates remote monitoring, real-time alerting, inventory management, web-based reporting and trouble ticketing, all for a monthly fee - worry-free and scalable based on your IT business needs. Stop chaotic service calls whenever something breaks or needs fixing. Allow us to provide preventative maintenance, security and peace of mind.